Sebastian Vettel is bidding to become the youngest double champion in history at this weekendâ€™s floodlit Grand Prix in Singapore. The Red Bull driver sits at the top of the championship with 284 points and needs other results to go in his favour along with a victory on the Marina Bay track. Vettel clinched his first title with a nail-biting win in the final race of the season in day-night conditions in Abu Dhabi last November. The 24-year-old said: “I’m in a very good position. “All my rivals would like to swap places with me and I’ll go into the race exactly the same way I have done all the others â€” trying to win. “But it’s not over until it’s over. You just have to look at last year as the best proof. We didn’t know until the last lap of the last race. “Obviously, this year it might be a bit different as I do have a lead but there are still a lot of races to go. “It has been an incredible year and it would be great to win on Sunday. Vettel has a huge lead of 112 points over second-placed Fernando Alonso, thanks to eight Grand Prix victories already this year. Brit Jenson Button and fellow Red Bull driver Mark Webber are five points further back on 167 points, while Lewis Hamilton is fifth in the standings on 158 points. Red Bull engineer Adrian Newey believes Vettelâ€™s win at the last race in Italy – wher he passed Alonso on the outside of Curva Grande at around 205mph – proves he wants to seal victory in style. 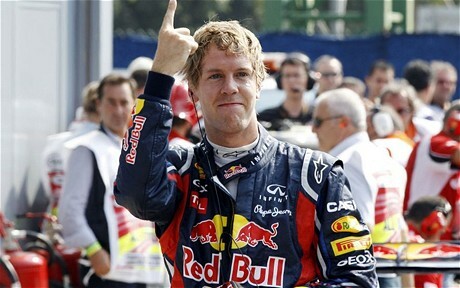 “Seb doesn’t want to cruise to the world championship, he really wants to earn it,â€ said Newey.